Initialize this object with the service definitions. Build a service url if the url needs no construction parameters. Build a service url if the url with construction parameters. Helper method which builds construction state for a service. This class builds urls for us to use when making web service calls. Definition at line 46 of file llservicebuilder.h. Definition at line 50 of file llservicebuilder.h. Definition at line 51 of file llservicebuilder.h. service_name The name of the service you want to call. option_map The parameters in a map of name:value for the service. Definition at line 110 of file llservicebuilder.cpp. References LLSD::beginMap(), buildServiceURI(), LLSD::endMap(), LLSD::isMap(), llendl, llwarns, and LLURI::mapToQueryString(). Definition at line 88 of file llservicebuilder.cpp. References LLSD::asString(), LLApp::getOption(), LLApp::instance(), llendl, llwarns, and mServiceMap. This method should probably be protected, but we need to test this method. Definition at line 66 of file llservicebuilder.cpp. 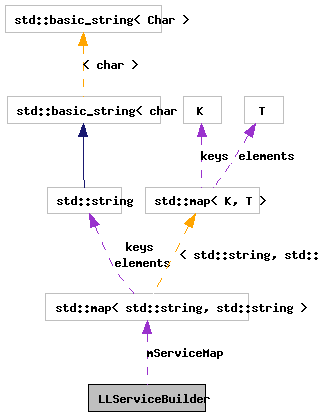 References LLSD::asString(), LLSD::beginMap(), LLSD::endMap(), LLSD::isMap(), LLSD::isString(), and mServiceMap. service_filename The services definition files -- services.xml. Definition at line 39 of file llservicebuilder.cpp. References LLSD::beginArray(), createServiceDefinition(), LLSD::endArray(), LLSDSerialize::fromXML(), llendl, llifstream, llinfos, and llwarns. Definition at line 91 of file llservicebuilder.h. Referenced by buildServiceURI(), and createServiceDefinition().